Neuland? Während es manche Hersteller es scheinbar nicht erwarten können, ein neues Netbook-Modell nach dem anderen auf den Markt zu bringen, haben Andere wiederum offenbar alle Zeit der Welt. In Punkto Mini-Notebooks wäre hier beispielsweise Fujitsu zu nennen. Der japanische Hersteller bringt mit dem M2010 nun sein erstes Netbook im 10-Zoll Format auf den Markt, mehr als ein Jahr nach dem Aufkommen der ersten Mini-PCs. Mit dem M2010 bringt der japanische Hersteller Fujitsu ein weiteres Netbook der 10-Zoll Klasse, zwar das erste aus eigener Herstellung, allerdings das (n+1)‘te Modell am Markt. Mit einem kompakten und durchwegs stabilen Gehäuse kann das M2010 durchaus punkten. Optisch ansprechend aber eher wenig praxistauglich sind allerdings die Hochglanz Oberflächen, die bald von zahlreichen Fingerabdrücken übersät sind, und außerdem anfällig für Verschleißerscheinungen sind. An Eingabegeräten bietet das M2010 von Fujitsu nichts Neues. Die Tastatur lässt sich subjektiv gut bedienen und auch die Tastengröße fällt akzeptabel aus. Lediglich mit dem englischen Layout sowie den Touchpadtasten hatten wir im Test so unsere Probleme. At Rs. 28,000, the product is just too expensive. Of course the main thing it has going for it is the classy mature look and feel, and also the well built and well finished surface and hinges. But that’s not the be all and end all. Its screen is very bright thanks to the LED backlight, but viewing angles suffer a bit. Concession for viewing angles can be given, as generally the user will be looking at the screen straight on, and this one has a bright enough one for offices and traveling. Battery life lets down this otherwise solid netbook from a local manufacturer. The only real complaint we have is the trackpad, which was unresponsive and imprecise to work with. We assume a firmware update will fix it, and in the meantime, the Fujitsu makes an appealing mid-range netbook. Tuned for high performance. Priced at US $408 Fujitsu Technology Solutions' M2010 netbook is priced competitively against models from other vendors, including Lenovo's IdeaPad S10-2 (also reviewed on ITP.net). 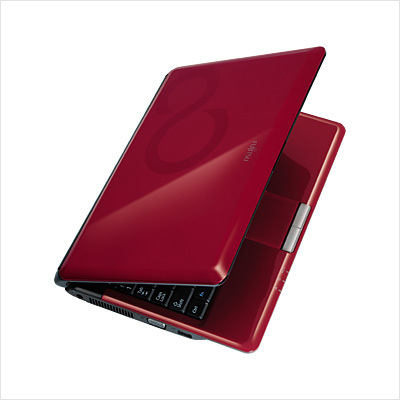 In terms of specifications the M2010 boasts identical components to Lenovo's IdeaPad; it has a 1.6GHz Atom CPU which is HyperThreading enabled, sports 1GB of memory and uses Intel's 945GSE chipset. A handsome netbook that boasts super-quick performance and lengthy battery life. It’s competitively priced too. As netbooks go, the M2010 isn’t a bad effort from Fujitsu and, had it arrived on our doorstep at the start of the year, it would have scored much higher. However, with so many models offering an almost identical core spec, manufacturers need to work hard to gain market share and Fujitsu has done little to make the M2010 stand out from the crowd. For just a little extra wonga, you can pick up a Toshiba’s excellent NB200, which features a far better keyboard and longer battery life. Ultimately, the M2010 brings nothing new to the table and it looks very much like Fujitsu is playing catch-up when it comes to netbooks. Fujitsu's new netbook has a lot of competition to stand up to. Fujitsu's first netbook – the Amilo Mini UI 3520 – was a usable and likeable device, but struggled to stand out from the crowd. Its successor – the M2010 – certainly seems more successful, but the jury's still out. While we can't make a final decision on how the M2010 fits into the bustling netbook market at this early stage, first impressions are very positive. As long as performance and battery life match the impressive build and usability, Fujitsu may have a winner on its hands. Fujitsu's first entry into the netbook market falls short. It feels lieka system designed over a year ago with the flaws found previously in other netbooks that have since been corrected. The biggest issue though is the overall cost. For $450, the unit is just too expensive compared to similarly equipped netbooks that cost almost $100 less. Then there is the issue with the extremely poor battery life with the base 3-cell battery that is well below average. A vent for the Fujitsu's audible but not annoying cooling fan is on the system's left side, along with VGA and USB 2.0 ports. 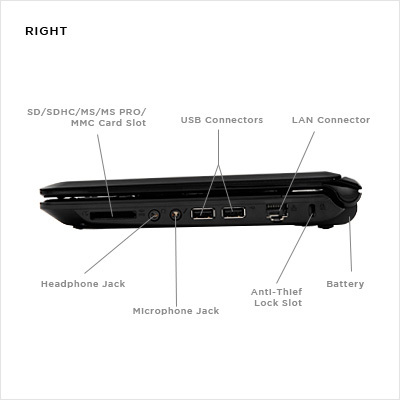 Two more USB ports are at the right, as are an Ethernet port, headphone and microphone jacks, and a Secure Digital/Memory Stick flash-card slot. 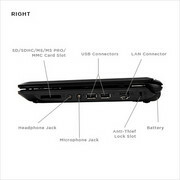 With many netbooks sporting 92- and 95-percent full-sized keyboards, the M2010 settles for 90 percent -- a 17.2mm key pitch, with the A through apostrophe keys spanning a hair under seven and a quarter inches versus a desktop's eight. It's a slight but noticeable squeeze compared to the 7.5 inches of the Eee 1000HE, requiring more conscious, careful fingerwork yet still suitable for touch typing. The keyboard's typing feel is good, as is the smooth response of the touchpad, although the latter's mouse buttons are noisy. The Fujitsu M2010 is a late arrival to the netbook market, offering very good looks and build quality, but with a high price and not so excellent performance. Compared to some of the newer netbooks on the market its benchmarks fall towards the bottom of the list, and battery life came up way short with the 3-cell battery. With its good looks and high build quality it seems to be pushed towards business customers, which might explain the higher price. Overall for if the price was about $100 less it would be much more attractive. In the end, Fujitsu didn't produce a bad machine--just a fairly average one. In a market already brimming with wannabes, I would have liked to see Fujitsu deliver more-daring designs, such as what it did with the U810, the U820, and the N7010 (which embedded a second touchscreen into an all-purpose portable). Plenty of other netbooks offer better performance for less. 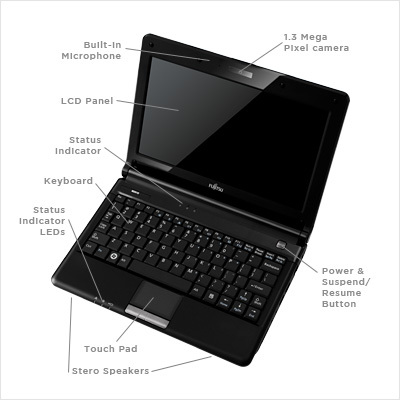 Might I suggest the Asus Eee PC 1008HA? Fujitsu is finally getting in on the growing Netbook trend, with an entry aimed at the educational market. The M2010 includes many of the same features already common in the increasingly-similar Netbook product landscape, but what differentiates it as an "education Netbook?" We were curious to find out, especially since the Dell Latitude 2100 made a similar--but much larger--splash in the educational arena just a few weeks ago. With a thick chassis and features that don't rise above the pack, the Fujitsu M2010 will have a hard time breaking through the clutter of less-expensive systems. Fujitsu’s entry into the netbook market is a snappy performer, but its battery life, keyboard, and price can’t compete with its peers. The Fujitsu M2010 is a case of too little, too late. While the netbook has a compact and stylish chassis and provides solid performance, its cramped keyboard and less than 2 hours of battery life hold it back. Additionally, its $449 price, which includes only a three-cell battery, is not competitive with the rest of the field. For $10 less, the Samsung N110 not only provides four times the battery life, but its keyboard is more comfortable; the same goes for the $379 ASUS Eee PC 1000HE. Until Fujitsu includes a six-cell battery standard for a lower price, we wouldn’t recommend this machine over the established netbook players. While other companies are launching two to three netbooks at a time (some even more), Fujitsu has been waiting patiently for its opportunity to enter an increasingly crowded field. And now the time has come. The M2010 has one of the most vivid and color-rich 10-inch widescreens in the business, and the infinity-symbol design is easy on the eyes, but it isn't without flaws. I can forgive the 89 percent keyboard, since this netbook is aimed at classrooms and at kids, whose hands are presumably smaller than mine. The Fujitsu M2010 has one of the brightest and most color-rich screens in the netbook market, but the price and battery life might keep it away from classrooms. With its M2010 Mini-Notebook, Fujitsu enters the U.S. netbook fray with a 10-inch model that looks great and delivers the expected features (and then some) for a netbook-appropriate price of $449. Unfortunately, though, the M2010 doesn’t match similar netbook models in battery life. Fujitsu’s entry into the 10-inch netbook market features a standout design, a great screen, and a usable keyboard, but the short battery life will disappoint on-the-go users. 68.13%: Diese Bewertung ist schlecht. Die meisten Notebooks werden besser beurteilt. Als Kaufempfehlung darf man das nicht sehen. Auch wenn Verbalbewertungen in diesem Bereich gar nicht so schlecht klingen ("genügend" oder "befriedigend"), meist sind es Euphemismen, die eine Klassifikation als unterdurchschnittliches Notebook verschleiern.